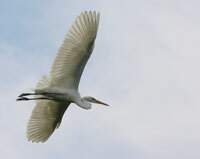 We’ll look for swallows, herons, and other birds of interest as well as butterflies and plants that attract them. The walk is run by the NJSEA and the Bergen County Audubon Society. For information contact Don Torino or call 201-230-4983. Register here. Join botanist Edith Wallace and Don Torino of the Bergen County Audubon Society as they look for plants that attract birds and butterflies and what works best in your garden. The walk is run by the NJSEA and the Bergen County Audubon Society.For more information contact Don Torino or call 201-230-4983. Register here. No, not snow. 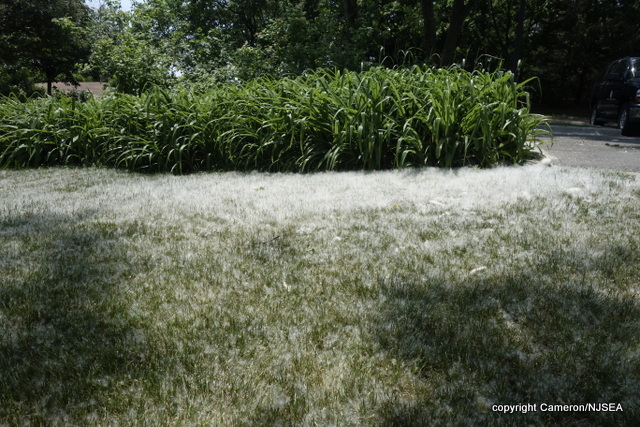 It’s the ‘cotton’ from the cottonwood trees, accumulating in the grass at DeKorte Park. The Eastern Cottonwoods (Populus deltoides) are shedding their seeds in dense fluffy masses that are scattered by the wind. 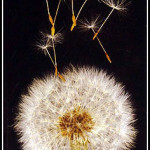 Each tiny seed has a tuft of silky white hairs which carry it aloft in search of fertile ground. In late spring, millions of cottonwood seeds fill the air around the meadowlands. 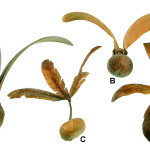 Many plants use the wind to disperse their seeds. Adaptations include gliders, spinners, parachutes, flutterers, and more. In the meadowlands, many common plants spread this way, since there are fewer mammals to transport seed (whether stuck to their fur or in their droppings) and fewer perching places for birds who might carry seeds to distant places. 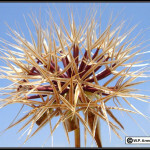 Read a good seed dispersal article on Wikipedia here. When the NJMC used goats to clear a neglected woodland in Rutherford in 2012 and 2013, a few eyes rolled. Now you can rent them on Amazon. But think about it – how did our ancestors maintain their lawns? Grazing. You can feed your livestock and manage your meadows at the same time. The great estates of Europe, with their elegant sweeping lawns, employed sheep and other grazers to keep their lawns manicured. They even wore shoes to prevent their hooves from damaging the turf. But I digress. 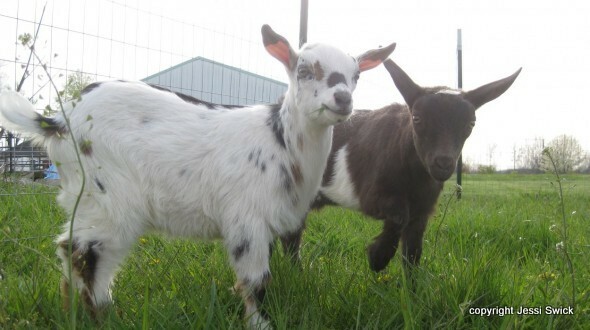 Rented goats are not a magic bullet for clearing overgrown lots – they cleared the 2-acre Rutherford lot of poison ivy, Japanese knotweed, and, to a lesser extent, phragmites in a couple of weeks. But they can only eat leaves and stems so the roots remain, which means the weeds grow back, though not as vigorously as before. Resident goats could keep down new growth as it emerges. The goats, of course, require fresh water and other care. But consider this: the cost estimates to bring in a crew to hand-pull and spray with glyphosate (Round-up) were as high as $30,000. The goats cost less than $3500 for each visit. So you could hire goats for 8 years or spray one time. The goats would leave a lot of fertilizer as well. See the article on Geek.com by Lee Mathews here. Get inspired to take action with this award-winning film celebrating Danish-born Jens Jensen (1860-1951), who rose from street sweeper to “dean of landscape architects” and pioneering conservationist. When he arrived penniless in Chicago in 1885, it was a fast-growing city teeming with urban squalor. Rejecting the neo- classical vision of the 1893 Columbian Exposition, Jensen joined Frank Lloyd Wright and Louis Sullivan in taking the prairie as inspiration for a new city design. In his parks, workers’ children enjoyed playgrounds and grew food in community gardens, and Jensen became known as “The Vexing Thorn” for his passionate battles with Chicago’s political bosses over the city’s future. 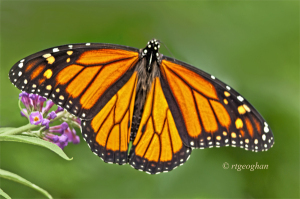 Grab your lunch and join Don Torino of the Bergen County Audubon Society who will show you how to turn your backyard into a butterfly haven. 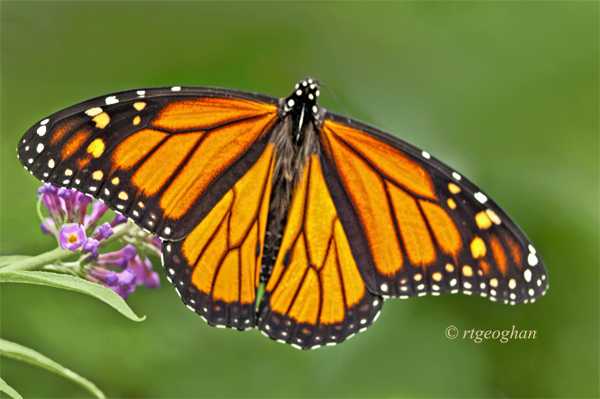 You’ll also learn how you can help the beautiful Monarch butterfly, whose numbers have declined precipitously in recent years. $6/person; $5 MEC members. Please register here. “Landscape architects are the people responsible for designing the parks, plazas, bike trails and other green spaces that make the outdoors fun, healthy, and sustainable. If you had to pick a favorite designed green space to photograph, which would you pick? 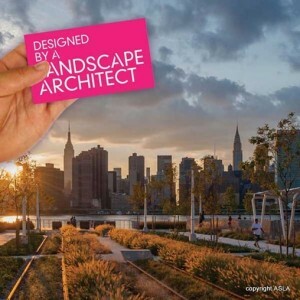 That’s the question asked by the American Society of Landscape Architects (ASLA) as it launches World Landscape Architecture Month in April.” Read more here. 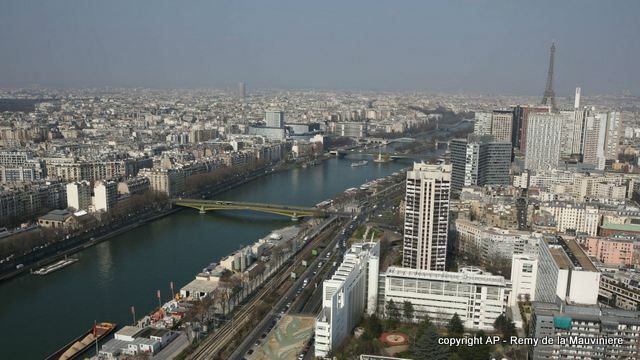 French parliament has passed a law that requires all new rooftops in commercial areas to be partially covered in either solar panels or plants. Green roofs aren’t there to just look pretty. They reduce stormwater runoff by absorbing water, provide habitat for birds and other wildlife, and minimize the amount of energy buildings use. Read about it here. 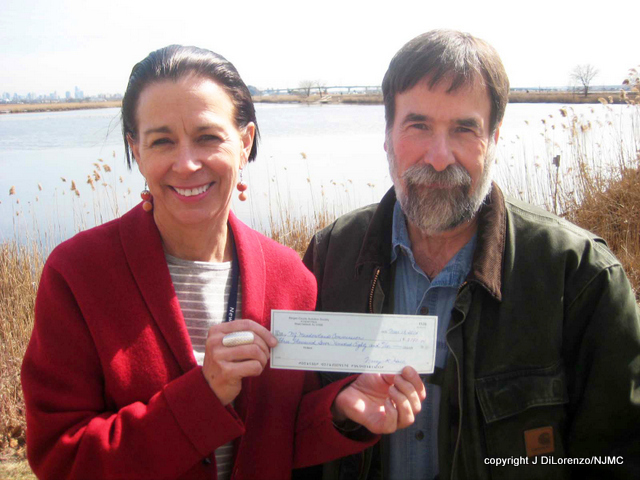 Don Torino of BCAS presents a check for $3780 to NJMC Landscape Architect Katy Weidel. The Bergen County Audubon Society, together with the National Audubon Society, has awarded a grant of $3,780 to the NJMC Parks Group to be used for enhanced native plantings at Mill Creek Marsh, especially near the entrance gate. The plants will be in place when the trail reopens following Superstorm Sandy repairs, slated to begin April 1, 2015. Work will be complete by the fall. Many thanks to BCAS for being both our partners and supporters! Like the rest of us, Don can’t wait for spring. 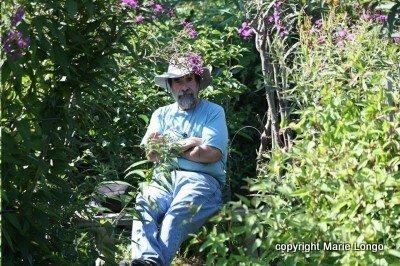 Read his wonderful new article for Wild New Jersey here. 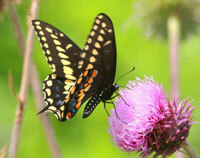 And don’t forget to sign up for his April 14th Lunch ‘n Learn talk Build a Better Butterfly Garden. $6/person, $5/MEC members. Register here.